I believe in transparent classroom walls. I do, to quote a Christian schools superintendent in Holland, Michigan, "we want our students to see the world." So, I'm completely against those 1970s school buildings with blocked up windows, and I'm against anything covering windows which connect the classrooms to school corridors, and I'm against closed classroom doors under the vast majority of circumstances. I want students to interact with the world, with the weather, with birds that may fly by and with cars which may drive by, and I want them to see and hear other learners doing interesting things. This isn't distraction, it is opportunity. Every thing which a student sees can create questions and open passions, and both of those are the gateways to learning. So clear off those windows and open those doors, but then, go a big step further. If you have a projector or an interactive white board in your classroom, keep it turned on, and keep it tuned to something fascinating. That is, throw open a "Fantastic Window" on the world, or even on the universe. These days many classrooms around the world are tuned in to the Decorah Eagles via UStream. This has been incredible. In just the time I have been able to watch I have seen, live, an egg hatch (the third eaglet), many feedings, the remarkable parenting of these birds through rain, snow, and high winds, the parents working together building what is definitely a safety railing surrounding the nest, and the amazing transformation of these tiny downy babies into the clumsy children you'll see today. Because I can't help but be fascinated, I, like millions of students, have dug into every bit of eagle information I can find: information which runs from genetic, to maturation rates, to hunting preferences, to the stunning size of the nests, to the political battle to save the bald eagle in the United States. It has been a learning experience of remarkable breadth and depth. Yes, I've known eagles as national symbols, and I've even watched them hunt over the Muskegon River flats, but I've never lived with these magnificent birds who top the food chain, and now I know a lot more about my world. You can look at other things, of course, say, the view from the top of Seattle's Space Needle, or watch the view from a satellite orbiting earth, or check out St. Pierre - the last bit of French North America, or a school in Iceland, or any of these (hundreds from everywhere). Wherever your Fantastic Window opens to you will be opening the universe to your students. But beyond transparent, you can be interactive. The Telectroscope which linked Brooklyn and London is gone, but the idea, the live and casual audio-visual linking of remote points should move to your classroom. As with the Decorah Eagles, a Skype video link connecting your classroom with another, across town, across grade levels (let fifth graders see middle school), across the state, across the nation, across the globe, lets you begin to see new environments and cultures with many fewer filters. It also opens up great collaboration possibilities. Can your 8-year-olds in the US ask for maths help from 8-year-olds in Ireland? In Venezuela? In Quebec? Skype has created a whole education community to promote this. So tomorrow, don't just throw open your classroom's doors and windows, add a Fantastic Window and a Classroom Telectroscope, and bring the universe in. I still can't understand why we had such a big push in the 90's to install the "information superhighway" in all of our schools, only to leave it largely untouched. It seems to me that the 'net's only acceptable use is as a big, electronic encyclopedia. Wouldn't print encyclopedias have been cheaper in the long run? And easier to navigate? If you aren't going to publish, if you aren't going to interact with others from around the world, what is the point of having it? My name is Brandon and I'm back again from Dr. Strange's EDM310 class at The University of South Alabama! In a world of ADD & ADHD, I might could understand why teachers would be afraid of the outside world. The way I look at it, however, is that if you are a teacher that can captivate a classroom and keep their attention, you shouldn't be worried about the outside world distracting them, but instead enhancing their learning! I cannot wait until beautiful days here in the South where I can take my class outside to learn in a natural environment. As for the Skype video links, I believe this is an invaluable tool! Having my class see others classes would be a great tool! They could compare and contract the way the other class works and I might even learn a few things about the class! Great blog and wonderful information! 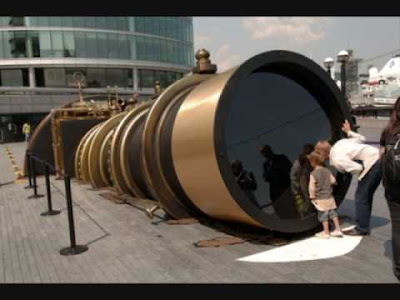 I ended up spending 15 minutes just researching the ideas behind the Telectroscope! So interesting!